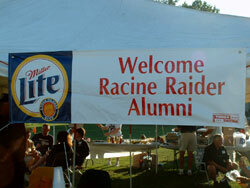 Did you know that the Racine Raiders have an Alumni Association? As a matter of fact, the Alumni Association began in 1991 and was the first of its kind at the semi-pro level of sports. We are always looking for anyone who has given their time and energy to the semi-pro football organizations in Racine. If you were a player, coach, cheerleader, trainer, water kid, board member, ticket seller, equipment person, or any other part of the organization, please contact us. Annual membership dues are $10 while a lifetime membership is $100. The benefits are great! You get into all Racine Raiders home games for free! That includes exhibition and playoff games. You’ll also get to attend the annual tailgate party. If you know anyone who was a part of our Racine semi-pro football teams over the years and needs a little push to join, e-mail us using the form below. We’ll contact them by phone or e-mail. If they need a bigger push, we’ll send over a few old linemen to talk to them!